Blessing Okagbare in recent time has been the only recognisable Nigerian face at IAAF Diamond League Meetings. 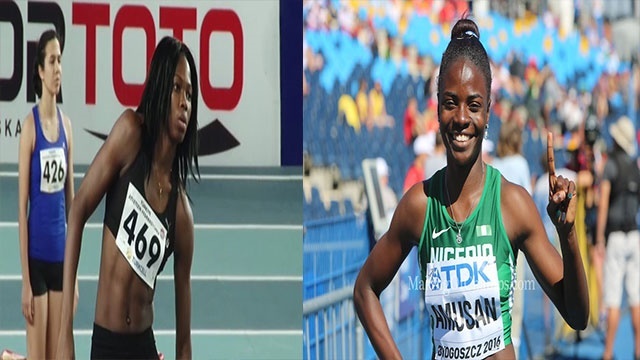 That would, however, change when the eighth-leg of the money-spinning event is held in Lausanne, Switzerland this weekend as the Nigerian duo of Tobi Amusan and Ese Brume have made it into the entry list of athletes billed to compete. This indeed is a huge step up for both athletes who have qualified for the World Championships in August, and having shown great promise since the Rio 2016 Olympics where they put up remarkable performances in their respective events, they will be hoping to go a step further this year. Amusan has been on top of her game this year to put it mildly. Among other achievements, she won the NCAA title with a Personal Best (PB) of 12.57s, she will hope to have a good outing in the Swiss city. For Brume, who has a Season Best jump of 6.64m, she will be hoping to ruffle shoulders with the big guns on parade. This includes, Olympic champion Tianna Bartoletta as many remember how she shocked the athletics world to win gold at the last Commonwealth Games in Glasgow.